All’s well that ends well, as Shakespeare once said. This feel-good sentiment certainly rings true if you are a Villa fan who celebrated uproariously on Friday afternoon when Christian Benteke signed a new contract with the club. Such was Benteke’s dramatic U-turn that many fans remained in a state of disbelief when the news initially filtered through. Mourinho’s strategy might have furthered his case with Rooney, but it certainly backfired in the case of Benteke. The Chelsea boss had previously leaked to one of his trusted journalists, Duncan Castles, that he was preparing a bid for Benteke, and in a subsequent act of flirtation, Eden Hazard spoke glowingly about both Rooney and Benteke. Across town, unfounded leaks emerged from Spurs fans that Benteke had visited their training ground shortly after he had handed in a transfer request. Interest on both sides between Spurs and Benteke seemed legitimate. Spurs were looking for a striker to lead the line and Andre Villas-Boas is known to be a big fan of Benteke. Sensing blood, the London press campaigned vigorously for Benteke to move to Spurs, “Villa need to lower their asking price…”, they grumbled in a succession of pushy articles. MOMS eBay listing of Benteke was in direct reaction to this media pressure of trying to lower Villa’s determined value of £25million – asking Spurs to essentially put-up or shut-up. If Benteke’s signature had been a game of poker, then Mourinho and Levy were certainly making all the noise, while Paul Lambert rocked back in his chair, sipped a Scotch and held his cards close to his chest. The Villa boss was forced to sit tight throughout nine turbulent days of speculation, fan unrest and media attention. Lambert chose to follow a calm and confident strategy as he left Benteke’s contract extension on the table, maintained contact with the player and communicated an official line of ‘disappointment‘ rather than anger. Amidst the whirlwind of speculation, Benteke flew into Birmingham for a “full and frank” discussion with Paul Lambert on Thursday, incidentally around the same time that Mourinho was giving his Machiavellian speech half-way across the globe in Kuala Lumpar. Little is known about Lambert’s persuasive ability as a man motivator, as he gives almost nothing away in press conferences, but whatever Lambert said to Benteke on his return to Bodymoor Heath appeared to have a decisive influence on the Belgian striker’s decision to stay at the club for at least another season. High stakes politics is not something Paul Lambert would have encountered at Norwich, since he did not have an asset valuable enough to interest any of the top clubs. 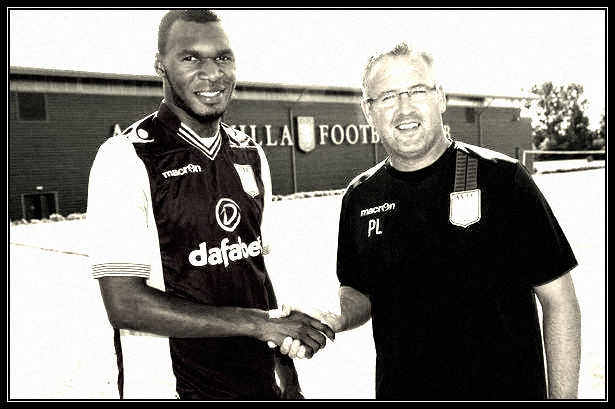 Yet it must be noted that Lambert’s handling of the Benteke situation has shown that he is a man to be reckoned with. Lambert’s calm and intelligent strategy has enabled Aston Villa to keep hold of their most valuable asset, and the press who trailed off in numbers since Benteke signed a new contract, are now reporting that Chelsea and Spurs interest has ‘cooled‘. In fact, their interest is probably in the deep freeze. Finally a well written Villa article (this is the first article I’ve read on this site, I’m commenting on thevillablog tripe and not your other articles as I haven’t read those yet). I haven’t been able to pick out any major flaws in Lambert’s management and transfer policies though the upcoming season will certainly be a test. I believe there will be a marked improvement, especially with Benteke staying and the influx of fresh blood, and I’m pretty excited to see how the new team ties together. Anyway, good article, well done. I thought that was a good article, my old man said,as for what went on with Benteke a lesson learned, don’t believe that the grass is greener if agents whisper you can get more money if you do as I say, he was badly advised by him. Lambert in my mind has a job to do, break that strangle hold agents and players have on our game, get young eager want to be footballers and players that play for that shirt. lewis123 Lambert sticks to his guns and has principles, he won’t be taken for a ride by the ‘modern game’. Villaman Sounds like you’d prefer Benteke to go…Mr ‘Villaman’. You forgive, but you don’t forget. Lambert played it well. They could have sold him for whatever the market price was – i.e. the biggest bid. Fans would understandably moan if he went (‘lack of ambition etc’), yet even when he stays, some still moan. As I said, ‘You forgive, but you don’t forget’. As for it being a ‘rubbish article’,you must be one hell of a writer by comparison, if you think that. Would LOVE to see your work. MRBAGGY If the midfield can give the forwards more support and chip in with the goals, we might go places and the likes of Benteke wouldn’t have a second thought of leaving. Villa do need something extra. Benteke can’t carry the team like last year, as he’ll be marked more closely.